The Meadowlands winter stakes have represented the launching of the stakes season for as long as the track has been open and this year, even under new management, is no different. The highlight events start with the first legs of the Clyde Hirt and the Presidential at the Meadowlands this weekend. The Clyde Hirt runs on Friday and the Presidential is set for the Saturday card. 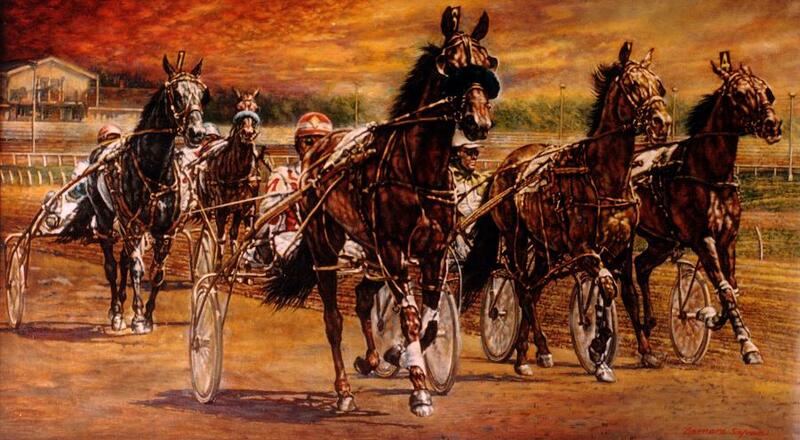 Four divisions of Clyde Hirt preliminary legs are scheduled for this Friday, Jan. 11, all looking to prove to be eventful miles four four-year-old male pacers (Mr. Hirt was a popular harness journalist through the sport’s golden years). The first division kicks off the card, with two likely favorites in the field: Vodka Is Terror and Star Chaser. We looked away from the chalk and looked for value, which shows to be in two horses, Bestjetyet and Connery Blue Chip. Bestjetyet is making his second start off of a layoff but what makes him look so appealing is how well he improved with the addition of Lasix. His last start was the first start with Lasix and he charged home in a :27.4 to finish third to the series favorite, Holdingallthecards. He should be closer to the pace this week and use that late kick to perhaps pull off a minor shocker. Connery Blue Chip is also a potential to upset. Before his two well-paced qualifiers he was coming off of four-straight victories at Yonkers. He shows gate speed so he’ll likely try to be on the lead or in the pocket and pass rivals into the stretch. Him and Bestjetyet will make a valuable play in the exacta. My Last Tri is our selection in the second division. He ships to the Meadowlands after several okay efforts at Harrah’s Philadelphia against non-winners of three. Exempting his last start, where he attempted to get in the mile from post 8, he has paced very good second-place finishes, picking up cover or getting into the mile somehow to close good ground. He draws the rail this week and it’s likely he will get a pocket trip, which should really benefit his way of racing. The third division looks to be the weakest, which should help Mr Dennis reach the winner’s circle. He raced against tougher in his last start, so post 8 didn’t help him too much (finished 10th in that mile). Before that event he shows valiant miles at Harrah’s Philadelphia and Pocono, emerging victorious in two of the five. He gets post relief this week, so expect him to get into the mix and perhaps make a move for the lead into the far turn. Holdingupallthecards will be tough to beat in the final division. Holdingupthecards will likely take the lead but the main rival to his gate-to-wire attempt this week will be Ringo. He generally gets away in third or fourth and makes a move for the top approaching the half. It could be possible that Ringo gets the lead and Holdingupthecards gets away second and Ringo could stroll around the oval on the lead from there. The Presidential series attracted 13 free-for-all pacers, the highlight of the bunch being Golden Receiver. Two $40,000 divisions are carded for Saturday, Jan. 12. Golden Receiver drew into the first division, so value will be tough to find here. We’ll try with Meirs Hanover. He chased Golden Receiver as he kicked away to pace home in :25.4 in the Free For All last week. Meirs Hanover will likely pace a pocket trip and could pass Golden Receiver if the big public choice is not feeling up to the task this week. The second division looks better for wagering than the first. Our value selection is Mr Hasani N. In a race where there is little pace, Mr Hasani N always launches off the gate, so he’ll be the likely tempo-setter. With the speed of the miles he has shown he could easily take this field wire to wire, which is the best we cam expect. Our horse-to-watch list (H2W) continues. This is the exclusive list released to TwinSpires harness players through this blog and there is no other list like it anywhere. It is our personal playing information and we are sharing it with you. All members of the list need to be considered serious contenders in the races noted. Wagering on any of them is based on your own judgment of value, as well as if you wager to win, place, show or in an exotic. If you have any questions about the H2W list, send them to us through the TwinSpires blog channel. Are you new to this blog? Here is a primer on how to read the H2W list. Before the horses’ names is the track, followed on the next paragraph by a date it (or they) will be racing, with the race in which they are entered (R and race number). If a + is in front of a horse’s name, it means that horse is appearing on the list for the second (and last time) because it failed to win the first time it appeared. An “ae” means the horse is on the also-eligible list and needs a scratch to get into the race. Sometimes up to three horses are listed in the same race; it is up to you how to deal with the situation (note that in the past this situation has resulted in exacta and triples).